As I was walking back into the house this morning after opening and closing the gate for my be'loved. I looked up and could still see the nearly full moon over a pine tree with a raven on top. It was a moment that seemed to stretch to eternity with it's beauty. 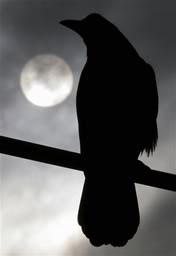 I know the Morrigan was speaking to my soul, just not sure of the message...yet.